When I talk about DC Comics or Marvel, and I criticize the regular, passable or interesting things (never bad) they do, I always have in mind two great motors as were “The Avengers” or the Batman trilogy filmed by Nolan (especially “The Dark Knight”). I ain’t a big fan of this gender of heroes and superheroes and, still, I have watched most of these films so I can have a specific opinion and some values to offer to my readers. In the same way, I am not a big fan of “shonen”: it’s true that there are big exceptions like “Dragon Ball” or “Death Note”, and these are, of course, some of the biggest exemples in my list (and some of the highest in position), but this doesn’t mean that this gender passionates me. 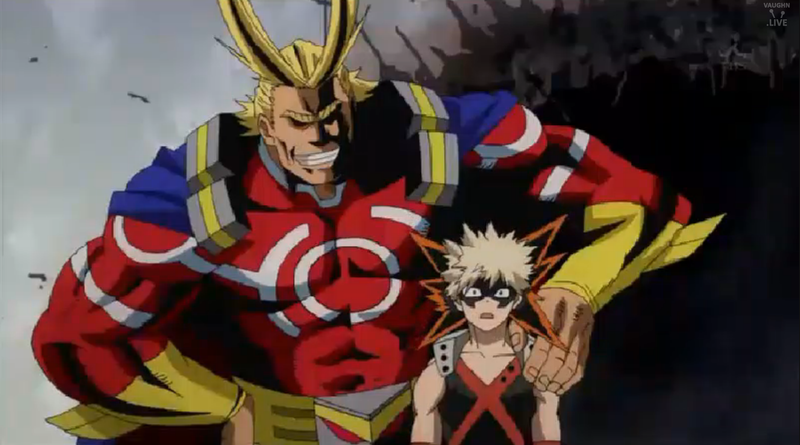 “My Hero Academia”, or “Boku No Hero: Academia” has been able to prove me wrong once more, as these examples did before, in many senses. I want to start saying that this critic is about the first 13 episodes, as I haven’t watched the second season (which in fact lasts almost the double). 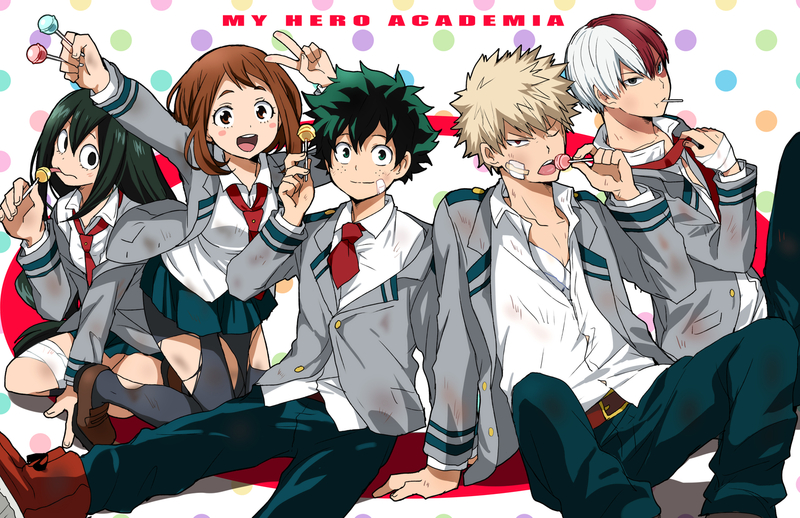 I point that I’m looking forward to keep watching Deku, Uraraka and all of the characters in the screen, and that I will probably these following days. I have read great things about the development of this series, especially in its second season, and I must say that I believe them entirely. Even if “BnH” is an example of simplicity and has a lack of originality, as it is what it is and we can’t expect to watch “Inception” or “Serial Experiments Lain”, at least, this anime does something extremely good, and does something new not only to shonen, but also to anime in general: a group of very interesting and well-written characters. “Boku No Hero” faces a huge issue: to present these characters (which are many) in a lapsus of time very short (13 episodes, as I said). Do you want to know what’s best? It affronts this stone in its way almost having fun of it. With one or two sentences, “BnH” is able to present these characters in a quick and effective way, without wondering about developping them as it wouldn’t work, or showing us their pasts; simply, it exposes its characters and announces what’s coming in future seasons. This would be a big problem if it wouldn’t wake the viewer’s interest, but all (or almost) of them wakes interest. Here enters the importance of visual: given to some incredible models, to some striking desings and to very concrete characteristics (and different the ones from the others), most of these characters are able to take place in our mind. Maybe it’s hard to remember all of their names, especially for us occidentals, but I’m sure that all of these phisical appareances will stay in your mind. That’s how a first season should work: as an introduction if your goal is to develop the story slowly and peacefully in future products. Just to give you an example, the biggest excuse of those who defend “Attack on Titan” (first season) is that the first 25 episodes are just an introduction. I’m sorry to say that this ain’t a reason to write flat and superficial characters: different fronts are open and later on stay in oblivion. The characters don’t breath as they should, and they are used as weapons to force the story. This takes a lot of credibility. I’m only saying this as an exemple; you have my opinion about “Aot” in my profil. “Boku No Hero” gets to do exactly the contrary: it presents a lot of characters and, in its 13 first episodes (half of AoT) offers to them a moment of glory. Maybe they’re not relevant, maybe they’re not deep, but putting this patrons in the screen so soon and in a serie that starts in such a modest (and not mediocre) way would be overloading a script which goal is to move forward calmly. 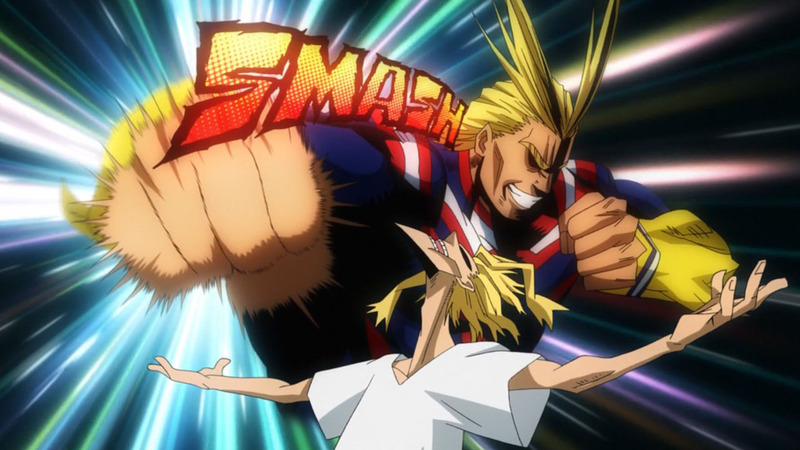 It’s true that we could ask something more about all of this; it’s true that it’s far from being brillant, sublime or perfect, as a shonen is what it is, and few examples like “Death Note” show us what you really can do in a screen directer for youth, but at least, “My Hero Academia” is able to do something different from the other shonen and creates a very worthy interest for what’s coming. There will always be detractors about great pieces, who avoid anime being stuck in big trunk like “Hajimete No Gal”. It’s a very unworthy situation that works this way in all industry and in all media. If it happens in true cinema, why wouldn’t it in japanese drawing?